The elongation factor GreA binds to RNA polymerase and modulates transcriptional pausing. Some recent research suggests that the primary role of GreA may not be to regulate gene expression, but rather, to promote the progression of replication forks which collide with RNA polymerase, and which might otherwise collapse. Replication fork collapse is known to generate dsDNA breaks, which can be recombinogenic. It follows that GreA malfunction could have consequences affecting homologous recombination. Escherichia coli mutants bearing substitutions of the active site acidic residues of the transcription elongation factor GreA, D41N and E44K, were isolated as suppressors of growth inhibition by a toxic variant of the bacteriophage lambda Red-beta recombination protein. These mutants, as well as a D41A greA mutant and a greA deletion, were tested for proficiency in recombination events. The mutations were found to increase the efficiency of RecA-RecBCD-mediated and RecA-Red-mediated recombination, which are replication-independent, and to decrease the efficiency of replication-dependent Red-mediated recombination. These observations provide new evidence for a role of GreA in resolving conflicts between replication and transcription. The GreA protein is an evolutionarily-conserved bacterial transcriptional factor, which interacts directly with RNA polymerase. Binding of GreA to paused and backtracked transcriptional complexes induces RNA polymerase to hydrolyze the last few nucleotide residues at the 3' end of the nascent transcript protruding beyond the enzyme's catalytic center, and resume transcription, in vitro  and in vivo [2, 3]. The extensively characterized interaction between RNA polymerase and GreA leads most simply to the idea that GreA functions in transcriptional regulation. Consistent with this idea, E. coli lacking GreA protein exhibits altered levels of expression of some of its genes [4, 5], as well as of the transcript encoding bacteriophage λ proteins which are synthesized late in infection . However, the magnitude of the gene expression effects is small, and a clear understanding of GreA's biological function remains to be obtained. Some recent studies have provided evidence that GreA may have a role in resolving conflicts between replication and transcription [7, 8]. In this study, greA mutants are shown to have effects on homologous recombination which can be most readily explained by a replication fork-preserving function of wild type GreA. These mutants were isolated in a screen for host functions which affect the cell's interaction with the Redβ recombination protein of bacteriophage λ. In wild-type E. coli, homologous recombination depends primarily on the function of two proteins, the RecA synaptase and the RecBCD helicase/nuclease. For genetic engineering purposes, RecBCD is often replaced by the Red recombination system of bacteriophage λ . The Red system, consisting of the single-strand annealing protein Redβ and the exonuclease λExo, can substitute for RecBCD in promoting RecA-dependent homologous recombination [10, 11]. In addition, however, Red confers new capabilities on the cell, including the ability of the cell's chromosome to recombine with short linear DNA species, even in the absence of RecA [12, 13]. In this RecA-independent mode of recombination, Red apparently acts by targeting the replisome, leading to either strand assimilation or a template switch [14, 15]. To probe interactions between the Red system and cellular proteins, Redβ was fused at its C-terminus to the SPA affinity tag  on a medium copy number plasmid, under control of the lac repressor. Redβ-SPA was found to be toxic, inhibiting the growth of wild type E. coli when induced. This toxicity is surprising, because Redβ itself is innocuous, and hundreds of non-toxic SPA-tagged E. coli proteins have been made and characterized . One possible explanation is that the synthetic toxicity of Redβ-SPA results from the delivery of the SPA tag to a critical site, possibly the normal site of Redβ action in the cell. As a hypothetical example, if Redβ normally binds to a replisome protein, it would necessarily have evolved to do so without interfering with replication. However, Redβ with the 69 amino acid residue SPA tag appended might bind to its normal site and clash sterically with another component of the replisome. According to this reasoning, cellular mutants altered in their interaction with Redβ could be selected as suppressors of Redβ-SPA toxicity. Several such suppressor mutants were isolated. Initial mapping showed that three of the mutations mapped to the same area in the E. coli chromosome. Fine-structure mapping and sequencing revealed that these three mutants each encoded a GreA protein with a single amino acid substitution: D41N (isolated twice), or E44K. The affected residues are particularly significant in GreA's activity. Both participate in the coordination of Mg++ ions in the catalytic core of RNA polymerase [18–20]. The greA-D41N mutation was found not to affect the level of either Redβ-SPA or Redβ as detected by western blot (not shown), ruling out the simplest explanation--that the greA mutants suppress the toxicity of Redβ-SPA by preventing its synthesis. To study the unexpected relationship between GreA and Red, E. coli strains were constructed bearing the greA D41N and E44K mutations, as well as a D41A mutation and a simple greA deletion, in a variety of genetic backgrounds. The strains were found to have a number of recombination-related phenotypes. Consistent with the idea that the greA mutants might be affected in their interaction with Red, λ behaves as if it had a mutation in either red gene (bet or exo), or both, when infecting these mutant bacteria. A λ red gam double mutant does not form plaques on a recA host, though red and gam single mutants do so . As indicated in Table 1, a λ gam single mutant fails to form plaques on a recA host when the recA host additionally bears a greA point mutation (but not a greA deletion). A deletion eliminating both red genes reduces λ plaque size; similarly, the greA point mutations in the host reduce the size of wild type λ plaques. As might be expected if mutating either red or greA is equivalent in this test, the greA point mutations have less effect on the plaque size of a λ red mutant than on the plaque size of λ wild type. This latter observation suggests that the greA point mutation primarily affects λ red function, rather than λ transcription, but does not rule out the possibility that there might be some effect on transcription. b. All strains bear a recAΔtet substitution. The effects of greA mutants on λ recombination were tested more directly in a marker rescue test, shown in Figure 1. The crosses were done in a recA host, to restrict recombination to the Red-promoted, replisome invasion pathway . Marker rescue was reduced 3-4 fold by the D41N and E44K substitutions, 2-fold by D41A, and very slightly by the greA deletion. The effects of the greA mutations on Red-mediated recombination are modest compared to the effects of a red deletion mutant, which reduces plaque formation in this test to the background of reversion, approximately 40-fold (data not shown). Marker rescue. A. λ cI857 R-am5, bearing an amber mutation in the endolysin gene R, can form a plaque on the non-suppressing host only if it recombines with the plasmid or reverts. B. Efficiencies of mutants relative to wild type. Titers of the phage on cells bearing the homology-containing plasmid, minus titers on cells bearing the vector (revertants) are determined, and divided by the wild type value. Means and standard errors of four experiments are shown. All strains are recA. The greA mutations also affect Red-mediated recombination outside the context of a phage infection. As shown in Figure 2, the efficiency of recombination between the bacterial chromosome and a linear dsDNA introduced by electroporation is reduced in the greA mutants, which exhibit the same rank order of effects as in the marker rescue experiment. Red-mediated chromosomal gene replacement. A. Strains bearing an alteration of the lac locus in which lacI through the N-terminal coding region of lacZ is replaced by the C-terminal two-thirds of the bla gene and the aph gene of Tn903 can recombine with a linear dsDNA generated by PCR and introduced by electroporation, creating an ampicillin-resistant, Lac+ recombinant. B. Efficiencies of mutant strains relative to wild type. Means and standard errors of three or four experiments are shown. Recombination via the RecA-RecBCD pathway is also affected by greA mutations. P1 transduction of the Tn10 tetRA genes inserted into several different locations in the chromosome was tested in the D41N mutant. In most, but not all cases, the mutant gave rise to more transductants than the wild type. A marker consisting of the metB gene replaced by tetRA was typical. As shown in Figure 3, the efficiency of transduction of metBΔtet is elevated by all the greA mutations. Again, the rank order of effects is the same, though in the opposite direction. The elevated frequency of transduction in the greA mutants could be attributed to an elevated frequency of recombination, rather than to a greater efficiency of P1 infection or tetRA expression, because P1 transduction of tetRA at some other loci, for example proAB or recA, was not elevated (data not shown). Transduction. Strains were infected with an amount of a P1 lysate grown on a metBΔtet strain sufficient to generate 50-100 transductants in the wild type. Ratios of mutant transductants to wild type transductants were calculated. Means and standard errors of 3-8 crosses are shown. A. RecBCD+ strains. B. Strains in which recBCD is replaced by red. To characterize further the specificity of greA recombination effects, the effect of the greA-D41N mutation on RecA-mediated recombination was tested in a strain in which recBCD was replaced by red. As shown in Figure 3, the replacement has little effect, in either a GreA+ or a greA-D41N background. In particular, the greA mutation stimulates RecA-Red recombination at least as much as it stimulates RecA-RecBCD recombination. The GreB protein of E. coli is very similar to GreA in structure and biochemical activities . The transcriptional effects of a greA deletion mutant are often greater in a strain in which greB is deleted as well [23, 6, 5, 8]. However, as shown in Table 1 and Figures 1, 2, and 3, deletion of greB had little or no effect on recombination, either by itself or in combination with greA-D41N. The DksA protein of E. coli, compared to GreB, is more distantly related to GreA, but it shares a number of structural and mechanistic features with the Gre proteins, including an acid-tipped coiled coil which reaches into the secondary channel of RNA polymerase to regulate transcription [24, 25]. Chromosomal dksA mutants corresponding to the greA mutants described above were constructed and tested for recombination phenotypes: a deletion fusing the first three and last three codons, and a double substitution mutation neutralizing both of the acid fingertip residues, D71N/D74N [24, 26]. In contrast to the greA mutants, neither dksA mutant exhibited either depressed or elevated levels of Red-mediated or RecA-RecBCD-mediated recombination, nor was either resistant to Redβ-SPA (data not shown). The mechanism by which the greA point mutations suppress Redβ-SPA toxicity was investigated by means of a complementation test. Wild type, D41N, and E44K alleles of greA, under control of their own promoters, were cloned in multicopy plasmids which are compatible with the Redβ-SPA expressing plasmids. The wild type greA plasmid was found to restore Redβ-SPA sensitivity to a chromosomal greA-D41N mutant, indicating that the suppression of Redβ-SPA toxicity does not result from a gain of function by the mutant GreA protein. Consistent with this conclusion, and more remarkably, the mutant plasmids do not confer Redβ-SPA resistance upon wild type E. coli, indicating that the wild type phenotype prevails even when the mutant gene has a higher copy number. However, interpretation of this latter result is complicated because the mutant plasmids significantly slow the growth of wild type cells, as expected based on the known toxicity of the mutant GreA proteins expressed at high levels . The known biochemical properties of GreA substitution mutants suggest that one effect of the D41N or E44K mutation would be to increase the amount of time RNA polymerase spends stalled in certain backtracked transcriptional complexes. In the mutant, it is likely that other cellular proteins which respond to stalled transcriptional complexes will play a greater role in resolving them. One such protein is Mfd, which not only dissociates stalled transcription complexes, but at the same time recruits proteins that repair DNA lesions . This line of reasoning leads to the question of whether mutant GreA suppression of Redβ-SPA toxicity is mediated by Mfd. Accordingly, wild type and greA-D41N strains lacking the mfd gene were constructed. Deletion of mfd was found to have no effect on either the Redβ-SPA resistance of the D41N mutant, or the Redβ-SPA sensitivity of wild type. It can be concluded that Mfd is not required for greA-D41N suppression of Redβ-SPA toxicity. The experiments described here show that E. coli greA mutants exhibit elevated levels of RecA-mediated recombination, and depressed levels of Red-mediated, RecA-independent recombination. GreA is a transcription factor, so these differing effects could be due to changes in gene expression, but recombination and DNA metabolism functions are not among the genes identified as significantly up- or down-regulated in a greA null mutant . A more likely explanation comes from the idea that GreA functions to prevent stalling of replication forks that run into conflicts with transcription complexes [7, 8]. Replication in E.coli is highly processive, and maintains this processivity despite the presence on the template DNA of transcription complexes which have an intrinsic ability to stall replication forks . Stalled replication forks are a potentially dangerous source of genetic instability, because they generate double-strand breaks through a process of RuvABC-mediated reversal and cleavage . The dsDNA ends resulting from these breaks are recombinogenic , so loss of a function which promotes the progression of replication forks is predicted to stimulate RecA-RecBCD and RecA-Red recombination events, which proceed via mechanisms that are largely replication-independent . Red-mediated recombination in the absence of RecA, on the other hand, is itself strongly replication-dependent [15, 32], so loss of a function which promotes the progression of replication forks might be expected to diminish it. The greA mutant phenotypes reported here are consistent with a model in which replication forks stall either more frequently or for a longer time in a cell in which GreA is inactive. Replication processivity in the mutant then becomes dependent upon other transcription-replication mediators. A functionally defective GreA protein, such as D41N or E44K, which can still bind to its normal site on RNA polymerase, might have an exacerbated effect, by competing with one or more of the other mediators. Two recent studies present evidence for a role of GreA in promoting the progression of replication forks. (1) Deletion of greA increases the UV sensitivity of a ruvC mutant. This effect of the greA mutant is suppressed by the RNA polymerase open complex-destabilizing rpoB mutant H1244Q. The investigators also found that GreA and DksA together contribute to the viability of a ruvC strain. They interpreted their observations as indicating that these transcription factors act at DNA lesions to resolve conflicts between DNA replication and transcription . (2) Cultures of an E. coli dnaC-ts mutant were synchronized by temperature shift, then, after replication initiation, treated with serine hydroxamate to induce amino acid starvation. The treated cells completed the round of replication they had started, but failed to do so if they lacked DksA, or if they lacked both GreA and GreB. The replication block could be eliminated by additional treatment with rifampicin, or by a DksA-bypassing mutation in rpoB, P546L, indicating that RNA polymerase was responsible for the replication block, and that the transcription factors affected replication through their well-characterized interaction with RNA polymerase. The replication deficiency of the dksA mutant in this experiment could be complemented by overexpression of GreA from a plasmid. In synchronized dnaC mutant cells that were not treated with serine hydroxamate, deletion of dksA slightly reduced the rate of replication fork progression; deletion of dksA, greA, and greB all together substantially reduced it. . To these two lines of evidence, a third is now added: in otherwise wild type cells, not treated with DNA damaging agents or metabolic inhibitors, greA mutations stimulate replication-independent recombination, and depress replication-dependent recombination. Stimulation of replication-independent, RecA-RecBCD-mediated recombination was not uniform, but rather was found to vary among different loci. This observation is consistent with the idea that the stimulation is due to the production of dsDNA ends as a byproduct of replication-transcription conflicts: such conflicts would not be expected to occur at a uniform frequency around the chromosome, because different loci are transcribed at different rates. Alteration of either of GreA's key active site residues has stronger recombination effects than simply eliminating GreA. This observation is consistent with previous studies of many GreA mutants, including D41N and D41A as well as other substitutions for both D41 and E44. These mutants generally reduce or eliminate GreA-induced transcript cleavage, but not binding to RNA polymerase [18–20]. Unlike wild type GreA, the mutant proteins inhibit elongation when used at high concentration in vitro . One unexplained observation of the present study is that the D41A substitution was found to have smaller effects on recombination than the D41N substitution, whereas Laptenko et al. found little if any difference in biochemical activities between these two mutants. Wang and coworkers propose that the various transcription-replication mediators, including DksA, GreA, GreB and Mfd, could be specialized to prevent transcription-replication conflict under different conditions . The experiments described here provide additional support for this interpretation: based on the recombination and Redβ-SPA sensitivity phenotypes, among these proteins, only GreA appears to have a significant role in mediating transcription-replication conflicts that arise during rapid growth in rich medium. Some qualitative observations on the growth properties of greA and dksA mutants are also consistent with this idea. The greA point mutants grow noticeably more slowly than either wild type or the greA deletion on rich medium (LB), but about as well as wild type on minimal medium (M9 glucose-thiamine). In contrast, the dksA D71N/D74N mutant grows about as well as wild type on LB, but only a little better on M9 glucose-thiamine than the dksA deletion mutant, which, as previously reported, grows very poorly on minimal medium . Redβ was fused to the SPA affinity tag as described by Zeghouf et al. , on plasmid pKM208 . The resulting plasmid, pTP1205, contains the lacI gene, a synthetic operon in which λ gam and redβ-SPA are transcribed from Ptac, and genes conferring resistance to ampicillin (bla) and kanamycin (neo). A derivative, pTP1206, was made by deleting bla. Further plasmid construction details are given in Table 2. The growth of wild type E. coli bearing pTP1205 or pTP1206, but not pKM208, is inhibited by addition of the inducer isopropyl-β-D-thiogalactoside (IPTG). For selection of Redβ-SPA-resistant mutants, the reduced-genome E. coli strain MDS12  was mutagenized with N-methyl-N'-nitro-N-nitrosoguanidine plus chloramphenicol . Plasmid pTP1206 was introduced into the mutagenized cells by electroporation. Kanamycin- and IPTG-resistant colonies were selected, and then screened, or re-selected, for the ability to grow while bearing pTP1205 in the presence of IPTG. Plasmid containing bla-P32-aacC. See the description of pTP1232 below. pKM208 × SP01,02 pcr of pJL148. The Red-mediated recombination event fuses the SPA tag to the C-terminal end of bet, deletes most of exo, and adds neo. pKM208 × cat29,30 pcr of Tn9 cat. The Red-mediated recombination event replaces a segment of pKM208 between lacI and the replication origin with the cat gene, flanked by BamH1 sites. pTP1215 × cat27,28 pcr of Tn9 cat. The Red-mediated recombination event replaces bla and the f1 replication origin with cat. Smaller, chloramphenicol resistance-conferring version of pKM208. A segment of λ wild type DNA was amplified by SR2,3 pcr. The product was digested with BamH1 and XbaI, and ligated with a BamH1- and XbaI-ended plasmid segment consisting of the Tn903 aph gene and the pSC101 replication origin. Deletion of sequences between the EcoRV and XbaI sites of pTP1222. The resulting plasmid contains λ sequences from 45262 in the S gene to 45828 in the R gene. Wild type, D41N, and E44K alleles of greA, respectively, amplified by PCR with primers greA5 and greA6, and cloned between the EcoR1 and BamH1 sites of a derivative of pBR322 lacking the sequences between the BamH1 and PvuII sites. Contains the sequences used to construct TP1234, DNA from which in turn was used as the template for PCR synthesis of the 587-bp dsDNA used in the tests of Red-mediated chromosomal gene replacement (sequence shown in Figure 4). It includes the bla gene of pBR322, the synthetic, unregulated promoter P32 (closely related to CP32 ), the lacZ ribosome binding site, and the N-terminal end of lacZ. Mapping of the Redβ-SPA-resistant mutants was done as described by Ortenberg et al. , except that the mini transposon conferred resistance to tetracycline instead of chloramphenicol. Each mutant was infected with λNK1098 to generate a population with random tetracycline-resistant transposon insertions. Lysates of phage P1 grown on the populations were used to transduce wild type cells to tetracycline- and Redβ-SPA-resistance simultaneously. The mutation-linked transposons were then located by the use of arbitrary PCR and sequencing; oligonucleotides used for this purpose are described in Table 3. The three greA mutants were first localized to the vicinity of yrbD and yrbC. An argG::cat insertion was then constructed, and three-factor crosses were employed to determine that the location of the mutations was between argG and yrbD (91% and 86% co-transduction, respectively). Sequencing of the region revealed that the three mutants had base substitutions altering greA codons 41 (GAC to AAC, D41N, isolated twice independently) or 44 (GAA to AAA, E44K), among other, uncorrelated mutations in nearby genes. a. Arbitrary PCR and sequencing to locate transposon insertions was done as described , but with primers designed for Tn10d(tet). The first round of PCR was done with primers Rtet1, ARB1, and ARB6; the second with Rtet2 and ARB2. Sequencing was done with Rtet2. Mutations were introduced into the greA gene of E. coli strain MG1655 by the use of Red-mediated recombination, in a two-step process. The first two bases of codon 41 or 44 were replaced with a tetracycline-resistance cassette. Oligonucleotides were then used to delete the cassette and insert the new bases . Recombinants were identified following kanamycin enrichment for tetracycline-sensitives; details of the protocol are given below. A deletion allele fusing the first three and last three codons of greA was constructed the same way. The greA alleles were verified by sequencing. The same processes were used to construct chromsomal dksA-D71N/D74K and dksA deletion mutants, except that the initial construction replaced ten bases in codons 71-74 with the cat gene. The greB mutation used in some of the experiments was introduced by P1 transduction as greBΔkan-FRT; the kanamycin resistance element in it was subsequently excised by the use of FLP recombinase as described . The mfd gene was deleted the same way. Other genetic markers were introduced into greA, greB, or dksA mutant strains by P1 transduction. Further strain construction details are given in Table 4. Following electroporation, bacteria were diluted into 15 ml of LB, and left standing overnight at 30°C for complete recovery from electroporation and outgrowth of fully sensitive recombinants. 0.2 ml of the culture was diluted into 5 ml LB and aerated at 37°C until a density of about 7 × 107/ml was reached. At that point, 2.5 ml of culture was mixed with 2.5 ml LB plus 100 μl of either chloramphenicol at 1 mg/ml or tetracycline at 0.4 mg/ml, and aerated at 37°C for 40 min. At that time, 2 ml of culture was mixed with 2 ml LB plus 40 μl chloramphenicol or tetracycline, plus 4 μl kanamycin at 20 mg/ml (for a final kanamycin concentration of 20 μg/ml), and aerated at 37°C for 40 min, then left standing overnight at room temperature. Portions of the culture were plated on LB, and the resulting colonies were tested for chloramphenicol or tetracycline sensitivity. Clones bearing the intended deletion were identified by the use of PCR and sequencing. λNK1098 bears the mutations cI857 and P-am80, as well as a mini Tn10 tet element and the Tn10 transposase fused to Ptac. It is similar to λNK1323 , but its transposase is wild type, rather than the Altered Target Specificity double mutant version borne by λNK1323. The amber mutation R5 , used in marker rescue experiments, was sequenced and found to change λ 45710 from G-C to A-T, which turns R codon 73, UGG, into UAG. The γ210 mutation , used in plating tests, was sequenced and found to change λ 33076 from G-C to A-T, which turns gam codon 53, CAG, into UAG. 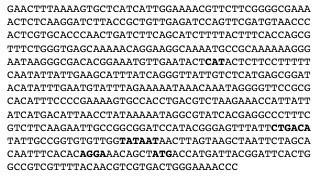 The deletion-substitution mutation redΔcat, used in plating tests, was constructed by the use of Red-mediated recombination , with a dsDNA made by PCR amplification of Tn9 cat with oligo primers cat38 and cat39 (Table 3). The deletion-substitution leaves in place the first three codons of bet and the last three codons of exo. Strains to be tested for Red-mediated chromosomal gene replacement were transformed with plasmid pTP1216, a derivative of pKM208 in which bla is replaced by cat. They were grown at 30°C in LB broth supplemented with chloramphenicol at 20 μg/ml, induced with 1 mM IPTG, and prepared for electroporation as described by Murphy and Campellone . Cells were electroporated with a mixture of 150 ng of a dsDNA generated by PCR of plasmid pTP1232 (Table 2) with oligo primers BLZ3 and BLZ4 (Table 3), plus 1 ng of plasmid pMB9 . The linear dsDNA was 587 bp, including 50 bp homology-targeting flanks (Figure 4). Following electroporation, the cells were diluted into 3 ml LB broth, grown with aeration for 2 hr at 37°C, and plated at 37°C on LB agar supplemented with ampicillin at 100 μg/ml, or tetracycline at 15 μg/ml. To adjust for variable growth rates and electroporation efficiencies, the ratio of ampicillin-resistant (recombinant) to tetracycline-resistant (transformant) colonies, normalized to that of the wild type control, was used as a measure of relative recombination proficiency. Sequence of the 587-bp dsDNA used in the tests of Red-mediated chromosomal gene replacement. The first and last 50 bases are the homology flanks. Bases in bold type are, in order, the start codon of bla (reverse complement), the -35 and -10 hexamers of P32, and lacZ ribosome binding site. I thank Hieuhanh Nguyen, Emily Rittershaus, and Mylorde Cherenfant for technical assistance; Martin Marinus and Jack Greenblatt for strains; and Sergei Borukhov and Jade Wang for helpful discussions.